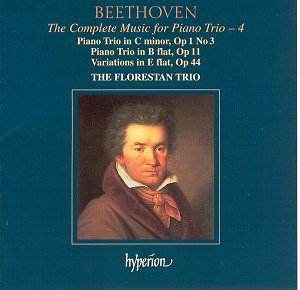 The Florestan Trio's unfolding Beethoven cycle poses a problem for the reviewer, though a welcome one: it's difficult adequately to describe the essential rightness of their performances. These players' command of the Beethoven style - a precarious balance between clean-limbed order and volatile explosions, all contained within rigorously crafted structures - is thorough and expertly conveyed. In the sonata-form movements as well as the variation sequences - not only Op. 44, but the finale of Op. 11 - the lyrical themes sing within the same basic pulse as the forward-driving, uninhibited allegro sections, drawing power and dramatic weight from the composer's sudden harmonic pivots while maintaining a sense of "Classical" proportion. In the C minor's third movement, labeled Menuetto, the minuet-shaped phrases carry a more scherzo-like temperament; the Florestans take the full measure of both these contradictory impulses, relaxing easily in turn for the unexpectedly gemütlich Trio section. The "lesser" Opus 44 variations - Beethoven deploying his expressive arsenal in the service of rugged, elaborately imagined entertainment music - sound as important as the two "big" trios in this fleshed-out treatment. No less importantly, this ensemble also finds the right Beethoven sound - as important a component of interpretation as phrasing or tempo, but one unaccountably neglected by otherwise fine artists. The firmly weighted tone of the piano provides the foundation for a dark, burnished ensemble sonority, into which the violin injects a brighter, more incisive note. (Indeed, pianist Susan Tomes deserves special mention for her dazzling, articulate, full-bodied passagework at all dynamic levels.) In both trios, the long-breathed themes of the slow movements - presented by the piano in the C minor, and by the dusky 'cello in the B flat major - acquire their grave dignity as much from the players' depth of tone as from their sober interpretive demeanour. Hyperion's first-class production, with the resonant ambience enhancing rather than obscuring musical detail, ideally complements the superior performances.